In the presence of angular velocity, there can exist a fictitious centrifugal force. This force is observed from a non-inertial reference frame. Fictitious centrifugal forces are associated with centripetal acceleration due to rotation of an object about a point. To illustrate this concept, consider a particle P that is firmly sitting on a turntable, which is rotating about point O at angular velocity w. The radius measured from point O to the location of the particle is R.
This acceleration is pointing towards the center O of rotation. The friction force (Fr) between the particle and turntable is holding the particle in place. This force is determined by applying Newton’s Second Law in the direction of ar. Now, let’s say there is no friction on the turntable, so that force Fr = 0. In this situation the particle would move outwards. This can be deduced from Newton’s Second Law. Setting Fr = 0, it follows that ar = 0. Since Newton’s Second Law applies to an inertial reference frame, this means that the particle must have zero acceleration relative to ground (which serves as the inertial reference frame). 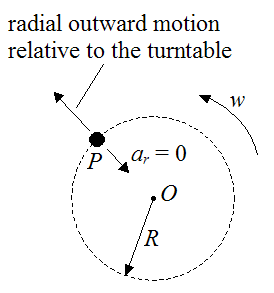 Thus, relative to a (non-inertial) reference frame attached to the turntable (and moving with it), the particle must move outwards, away from the center O. The particle would continue moving outwards until it falls off the outside edge of the turntable. From the point of view of an observer sitting on the turntable (and moving with it), the fictitious centrifugal force is the apparent force that appears to be acting on the particle, pushing it radially outwards, away from the center O. The line of action of this apparent force passes through the center of rotation O. But in reality, there is no actual force acting on the particle. What the observer sees is just a consequence of the particle having zero acceleration relative to ground; which means that (relative to the turntable) the particle must move radially outwards. This is a direct result of Newton’s Second Law, which applies to an inertial reference frame (ground). 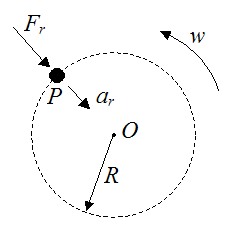 The figure below illustrates the outward radial motion of the particle. An interesting problem related to this is problem # 7 in Physics Questions page. It is worth mentioning that the velocity of the particle relative to the turntable gives rise to another fictitious force, known as the Coriolis-force. And if the turntable has angular acceleration, this gives rise to yet another fictitious force, known as the Euler force. 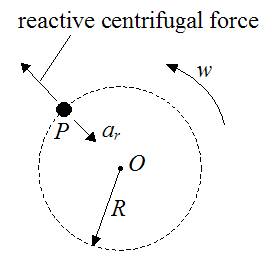 The reactive centrifugal force is defined as the reaction force to a centripetal force. A centripetal force is the force exerted on an object that is experiencing centripetal acceleration – this force points towards the center of rotation. This is the force acting on the particle as it revolves around on the turntable with centripetal acceleration ar = w2R (relative to ground). Therefore, the reactive centrifugal force is the force exerted by the particle on the turntable. By Newton’s Third Law this force is acting in the direction opposite to the force Fr. This is illustrated in the figure below. Unlike a fictitious force, the reactive centrifugal force is a real force based on the acceleration of the particle relative to an inertial reference frame (ground), which is given by ar = w2R.